This is the place for new garage door sensors, garage door openers, garage doors, or anything related to your garage doors needs. Our company utilizes the years of experience we have gathered in the commercial garage door installation business. Over the years we have commissioned thousands of new garage doors in Los Angeles and provided excellent service to our customers. Our certified professionals have received accolades and appreciation from both commercial property owners as well as residents of Los Angeles. We know exactly what your needs and demands are. This is why we are in a unique position of offering you advice about each aspect of installing or repairing garage doors. We can offer you help in selecting everything from the design, prices, spare parts, workmanship, and in problems related to garage doors. We have a huge selection of custom made Steel Garage Doors, Wood Garage Doors, Aluminum Garage Doors by some of the top brands in the industry. We offer, Amarr, 1st United Door Technologies, Raynor, and Clopay Garage Doors. We have a staff of dedicated and experienced professional garage door repair technicians which will help you in choosing windows, materials, colors and package that will fit your needs. We will make sure that you get full value for your money and feel happy each time you look at your garage door. At Garage Door Repair Los Angeles, we have a team of dedicated, certified and trained professional technicians. Our service trucks have the best trained people in the industry and the best equipment. We can respond to your calls within two hours on the same day. Feel free to call (888) 531-1958 to schedule a meeting with our representatives. Making the choice of new garage door opener should be extremely easy. Let us help you make everything easier. Of all the different gate openers available in the current market, these are the ones that make the least amount of noise. What makes them unique is that most of our belt manufacturers offer a lifetime warranty on their products. These are considered as one of the top garage door openers in the market since they offer excellent quality and low noise operation. This particular kind of garage door opener has a slight advantage over chain driven garage door openers. Screw driven garage door openers use a different mechanism for opening the garage door since the whole assembly is attached to a steel rod. They are quite powerful and make use of few moving parts which require very little maintenance. If you want a unit that will save you some extra money, drive garage door openers are an excellent choice. They are quite popular and many customers prefer them over other kinds of garage door openers. The Direct Drive Jackshaft opener is ideal for garages with low ceilings. The installers mount it on the wall in which it derives the power from a super quite DC motor. It is an excellent choice for a garage door opener. You can choose from one of the two most popular kinds of springs that are available in the market. These two types are garage door torsion springs and garage door extension springs. We usually install garage door extension springs at the side of the garage door tracks. 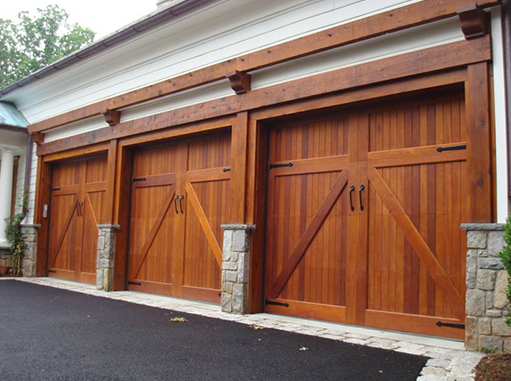 They are commonly used for garage doors that aren’t too heavy. On the other hand, we usually place garage door torsion springs at the top of the garage doors. We recommend these types of springs for heavier doors. In order to make the right choice for your garage door spring you should seek advice from one of our professional technicians who are experts in the garage door repair service. Our company handles various kinds of repair work and maintenance for garage door springs. If your spring has broken down due to uneven load, has become worn with over usage, or age it needs to be replaced immediately. We recommend that you should not try to fix it yourself. Changing a loaded spring can be a very dangerous proposition. Especially, for someone who doesn’t have the experience or technical knowledge to handle it. Loaded springs can be quite unpredictable. It always pays to be safe. Hire technicians who have the experience, knowledge and certifications that are required for the job. You won’t regret it.